Bible Cartoons: Character sheets for famous and infamous people from the Bible! Character sheets for famous and infamous people from the Bible! This is a little Blog addendum to my article of 09/July/2018. “Search by Bible Character” is now a live, working page on the Bible Cartoons website. I am gradually adding a Character sheet for the various people represented in the page’s list. 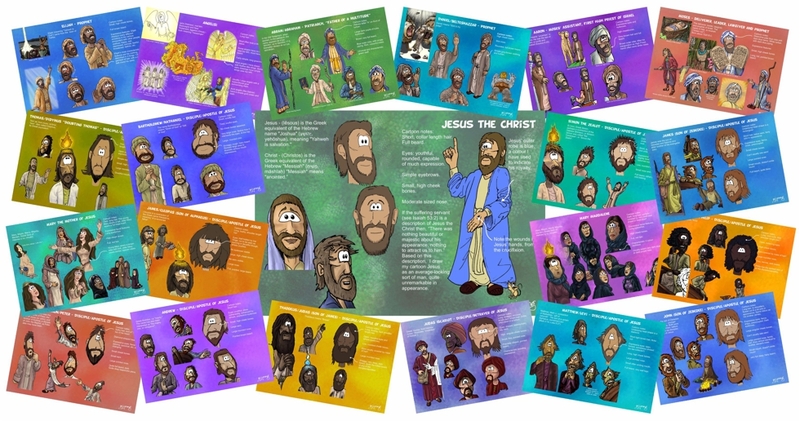 Initially each Character sheet included a large “head shot” of the person, with a variety of other pictures (head or full body), showing various facial expressions, taken from a variety of Bible Cartoons that featured the person in them. I included notes about what makes that particular character drawing unique (eg notes about eyes, noses, mouths, clothing, etc) on the right hand side of the sheet, and then some notes about their name, and what the person did in the Bible. I quickly realised that the notes about what makes the person famous (or infamous), ie their life story, could go underneath the Character sheet, in a block of text, which would leave me more room on the sheet itself to include more examples of that person’s facial expressions (as drawn in my Bible Cartoons). That seemed like a good idea, so I have re-vamped all Character sheets and re-uploaded them based on this design idea. Please note: the Character sheets are used in TWO different places on the Bible Cartoons website, the first in on the “Search by Bible Character” web page, the second is in the BC Encyclopaedia website pages. The various people that actually HAVE a Character sheet at all are represented on the “Search by Bible Character” web page by a green square, after their name, in the alphabetic character list. I include that green square to make it easy for viewers to see which people have a Character sheet, and which ones don’t… yet! You will only see the Character sheet once you click on a particular person’s name with A GREEN SQUARE NEXT TO IT. You then see (on a separate web page) that person’s name, the Character sheet, a count of all the Bible Cartoons that the person appears in, and then a complete list of all those Bible Cartoons. You can click on any of the little thumbnail pictures and are then taken to that Bible Cartoon, seen at full size, with purchase options. When you navigate to the BC Encyclopaedia website page, you’ll see a list of all the people which have a Character sheet design associated with them. If you click on one of the names (eg Moses Character design sheet) you’ll see that person’s name, the Character sheet, followed by a block of text below it. The text includes the “Personal History” of that character. That “Personal History” text block is ONLY visible on the relevant BC Encyclopaedia website page, it is omitted when you see the character sheet on the “Search by Bible Character” web page, for brevity. I have tended to create a Character sheet only for those people/characters in the Bible who I have drawn quite a few times. There are currently 145 names on the “Search by Bible Character” page, but only 5 Old Testament, 15 New Testament and 1 “Group” Character sheets. So I’ve got quite a few more Character sheets to create to catch up! Plus, I’m adding new people to the “Search by Bible Character” page as I illustrate them, so it’s an uphill job, catching up! Keen-eyed readers will realise that the NT list includes Jesus and his 12 disciples/Apostles, plus his mother Mary, and Mary Magdalene.